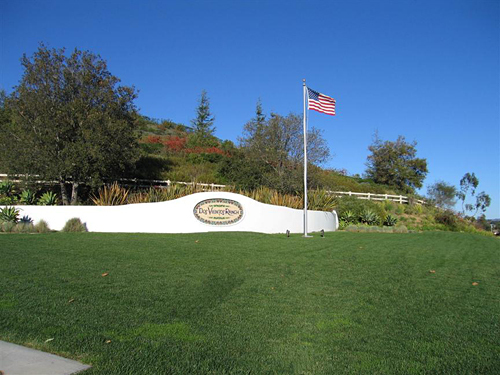 Offering a pristine location, breathtaking surroundings, exquisite homes, and a lifestyle filled with the finest amenities Thousand Oaks has to offer, Dos Vientos Ranch is a master-planned community like no other. Nestled amid the rolling hills of Thousand Oaks and set against a stunning backdrop of the Santa Monica Mountains, this 2,300-acre community offers wide open space and soothing ocean breezes, creating an unparalleled sense of serenity. At completion, Dos Vientos Ranch will offer miles of hiking, biking, and horseback trails, a daycare site, an elementary school, and more than 50 acres of maintained parks and ball fields. More than half of the land in Dos Vientos will remain preserved in its natural, pristine state. Located about two miles south of the 101 freeway, this much sought-after community is located in the desirable Conejo Valley. It is close to upscale shops, a host of restaurants, California Distinguished Schools, and several highly rated colleges and universities. Residents can also enjoy a wide array of opportunities at the Thousand Oaks Civic Arts Plaza and the nearby Ronald Reagan Library and Museum. Offering the perfect home for every kind of buyer, Dos Vientos Ranch offers a spectrum of unique neighborhoods from move-up family homes to luxurious custom estates crafted by California's leading home builders, including Greystone Homes, Standard Pacific Homes, Brookfield Homes, D. R. Horton, EPAS, Warmington Homes, Davidon Homes, Larwin Homes, Taylor Woodrow, Trimark Pacific, and S & S, and Shea Homes.